“a Lamp to my feet. a Light for my path.” – Psalm 95:8 | A LAMP TO MY FEET. A LIGHT FOR MY PATH. at making them sensitive to God’s voice. ‘Do not harden your hearts,’ the Psalmist says. Conscience throws light on all of one’s life. It can be deformed and hardened. and can commit the most dastardly abuses against himself and against others. and man can make progress because of it. he can raise himself and continue onward. is now without signposts…and is lost. that bitter is sweet and sweet is bitter! 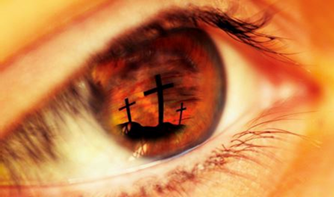 Jesus compares the function of conscience in our life to that of an eye. “When your eyes are healthy, your whole body also is full of light. But when they are unhealthy your body also is full of darkness. things are seen as they are, undistorted. who can come to think that things are in fact as he or she views them. It can lead to problems and difficulties which are, at times, of little importance. its consequences have no limit. Open the eyes of my heart, Lord, and help me see Your truth. Soften my heart, Lord, that I may do only Your will.